This is a first attempt at a Blood Bowl match report. I wanted it to read like a Cabalvision Broadcast of a game on the radio or television. Let me know if you like this format or would prefer another. I have been playing Blood Bowl for a long time, and got the new edition when it came out. You can read my review here. Since then, my daughter has been learning to play using the boxset. We have managed to play a handful of halfs and games here and there. However, this was our first attempt to document a full game. For this exhibition game, we stuck to the models in the box. In addition, we decided to not use Fame or Team Re-rolls. Just straight skill re-rolls only. This is a standa alone game. My daughter took the Ork team, and I took the coaching role for the Humans. Enough talk! Let's play some Blood Bowl. Lord Summervale: Welcome ladies, gentleman, peasants, and beasts to Cabalvision IV’s regional coverage of the Deep North- Southern Regional Blood Bowl Conference. After the break-up of the NAF, small local leagues like this have been popping up across the Old World. Today’s coverage is a hyper-local affair and we at Cabalvision IV are glad to bring you coverage of the game no matter how insignificant it is! I, Lord Summervale, will be today’s announcer. I am joined at Citadel Arena in the booth with my faithful comrades Mad Johan for commentary, and thrower for the Rat Packers Favre Da’ Cheesemonger. Mad Johan: Great to be here today Summervale, no matter where here is. It looks to be perfect weather for Blood Bowl. Mad Johan: So even less important than usual. Summervale:… between the Nottingham Nobles human team and the Skullsmash Reeverz ork team. It is great to be here at the Nottingham Nobles new turf that their fans affectionately call the Citadel. With that, let’s take look at our starting line-ups for today’s match. The Nottingham Nobles will be…. ….led by their starting Thrower Rick Priestley. Mad Johan: Rick is apparently also a major player in the formation of the Nobles team. Summervale: He will be accompanied on the pitch by two Blitzers: Matt Ward and Jervis Johnson. In addition, the Nobles are fielding two Catchers; Alessio Cavatorre and Gav Thorpe. Then the rest of the line-up is made up of their trusty team of lineman. Mad Johan: No point in namin’ them till they do something useful. Summervale: Right oh old chum. Onto the Skullsmash Reeverz. They will be led by their infamous team Kaptin Grimgrod Rotgut as the Thrower. He will be accompanied by 2 blitzers; Ruk Ruk and Gobsmacka. In the line-up are also a pair of Black Ork Blockers, Da’ Big Smacka and Bad Ammer. The rest of the line-up is filled up with line orks. Mad Johan: I have never heard of any of these guys. What league are we in again? Summervale: With that, since these are new expansion teams in an exhibition match each team is relatively new to the game. They have elected to play an open and fair game of Blood Bowl with no Team re-rolls in place. Mad Johan: A team what? 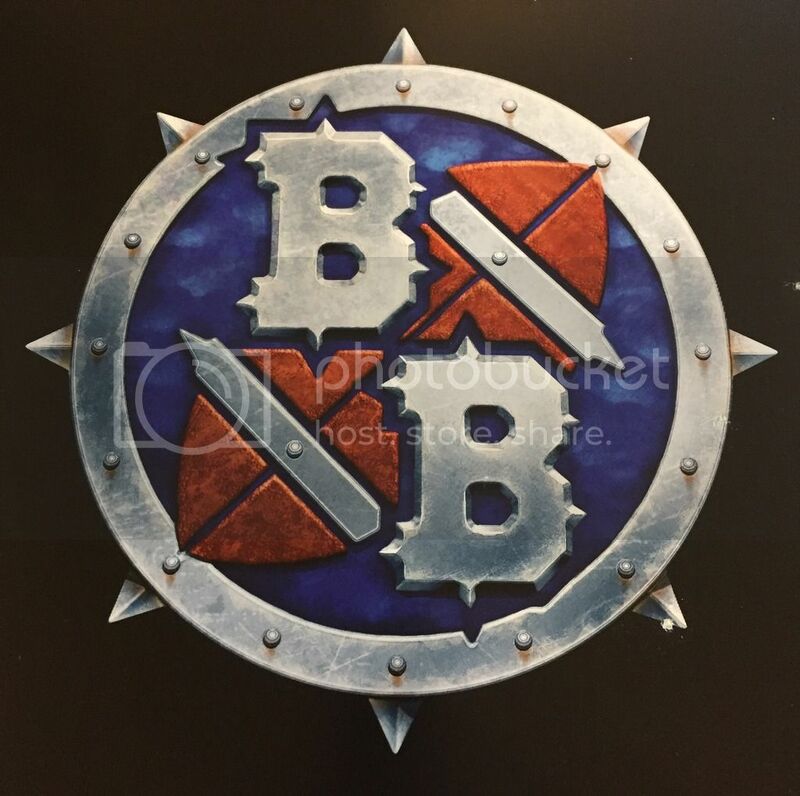 Summervale: Both teams will be using the bog standard rules for Blood Bowl found in Nuffle’s main handbook. Nothing fancy here. Mad Johan: Let’s get on with it then! In the thread the photos got Photobucketed, but in the blog they are fixed.